Kate is excited to publish her first book. 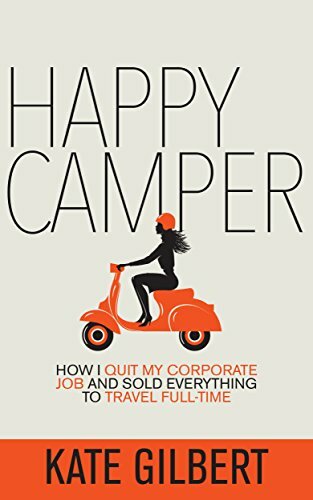 Happy Camper: How I Quit My Corporate Job and Sold Everything to Travel Full Time. If you've ever dreamed about quitting your job and walking away from everything to start a new life, then this book is for you. Kate did exactly that. At the age of 45 she left her lucrative executive career, sold her home and everything in it and hit the road to travel full-time. She realized that she was just not happy enough and if life is not about relentlessly pursuing happiness then what the hell is it about? This is not just a typical escape the rat race story. The book does not describe alternative ways of earning money or how life is wonderful living on a Caribbean island. It's also not a How-to live in an RV book. There are lots of great versions of these already. Instead you'll learn from the real-life experience and emotions of making the purposeful decision to change your life for the better. Kate talks candidly about how tough making a change can be. She describes how her once loved career became something unrecognizable. She changed her way of thinking, making conscious decisions about what to care about and what to let slide and how she lived, getting rid of 95% of everything she owned. She reflects on her first year of traveling full-time and answers some of the questions that are most frequently asked of her about her new lifestyle.